It was a fairy tale come true when Mark Dorn—handsome pilot, widower, tragic father of three—chose Jiselle to be his wife. The other flight attendants were jealous: She could quit now, leaving behind the million daily irritations of the job. (Since the outbreak of the Phoenix flu, passengers had become even more difficult and nervous, and a life of constant travel had grown harder.) She could move into Mark Dorn's precious log cabin and help him raise his three beautiful children. But fairy tales aren't like marriage. Or motherhood. With Mark almost always gone, Jiselle finds herself alone, and lonely. She suspects that Mark's daughters hate her. And the Phoenix flu, which Jiselle had thought of as a passing hysteria (when she had thought of it at all), well . . . it turns out that the Phoenix flu will change everything for Jiselle, for her new family, and for the life she thought she had chosen. Wow! I have to warn you -- this review was very difficult for me to write. I don't feel like I expressed my thoughts about this book very well! 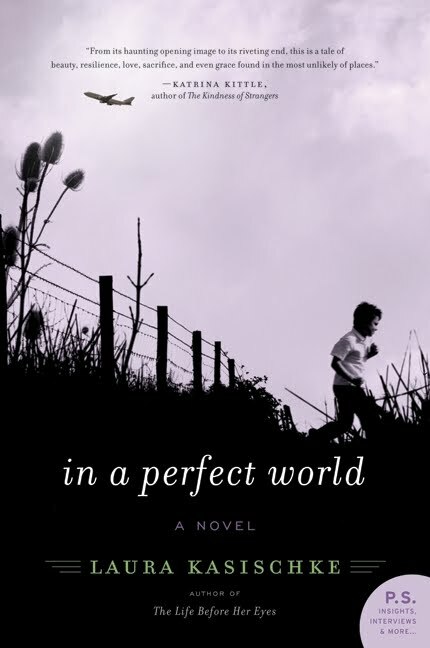 When I first picked up IN A PERFECT WORLD by Laura Kasischke in preparation for a Book Club Girl's BlogTalk Radio show, I was expecting to read a story about a woman who discovers how challenging it is to be a step-mother. I figured it would be a typical story about teenage angst and a woman who learns to adjust to her new life and family. I was kind of correct because IN A PERFECT WORLD was about a woman who is thrown into a difficult family situation. However, I was in no way expecting this novel to be what it was -- it was so much more than just a book about a step-mother! I'm not sure that I can even say that I liked IN A PERFECT WORLD because it was so dark and depressing -- and even a little scary. As I read this book, I was extremely uncomfortable and troubled; and at times, I felt as if I was missing out on some things. I can, however, say that I did appreciate IN A PERFECT WORLD. What I found so odd was that as ill-at-ease as I was when I read this book, I still couldn't put it down. It was a difficult read for me because of the subject matter, but the writing and characters just pulled me in. I thought the author did a very good job of developing the characters as well as the horrific conditions of the flu outbreak. While the book was in so many ways an apocalyptic novel, I found it very believable -- that's probably why I was so uncomfortable while reading it! I truly liked the character of Jiselle and I enjoyed how she handled her challenges to the best of her ability. In addition, I found that I liked most of the characters by the end of the story; and I definitely appreciated how they matured throughout the novel. I thought the author handled the relationship parts of this story very well; and I also liked that despite the dark nature of the story, I still felt as if there was some chance of hope and love when I finished reading this book. I don't know if this book affected me more because of the recent news about H1N1, but I found it fascinating (and quite troubling) that the author explored the affects of a major flu outbreak on the world (and especially the United States.) I read that Ms. Kasischke did a great deal of research on the Black Death while writing IN A PERFECT WORLD, and I found it so interesting how she incorporated the behavior of people in the past into the modern-day setting of this novel. I was especially impressed with how she wrote about the fear and panic aspects of society as well as human's need to blame something for the tragedy. IN A PERFECT WORLD would make a marvelous discussion book for any book group that likes to discuss literary fiction. While I admit that I was bothered by the subject matter, there is no doubt that this novel really affected me and definitely made me think. After I finished this book, I really felt the need to discuss it with others. I have a feeling that there is a great deal for book clubs to uncover in this novel from the various characters' actions to the portrayal of society as a whole. In addition, there are many symbols and themes to further analyze. There is a reading guide available which poses some very interesting and thought-provoking questions. Tonight, Book Club Girl is hosting a BlogTalk Radio show with Ms. Kasischke at 7:00 p.m. ET. I am really looking forward to hearing the author discuss her novel because I think it will give me some additional insight into the story. I am also very anxious to learn her inspiration for this very unique novel! Thanks to Book Club Girl for sending me a copy of this novel. Julie, I just finished this book myself and couldn't agree with your assessment more! I was captivated by the book . . . but I didn't enjoy my captivation as much as I wanted to. I also thought it was awfully close to the YA book, "Life as We Knew It" which our mother/daughter book club loved. Wow -- sounds powerful and difficult. I'll have to think about whether this is for me. Wow, that sounds like an amazing book. Tonight's BTR show should be fantastic. This sounds intriguing and -- yes -- painful to read. I really enjoyed reading your reactions. ahh adding this to my ever-growing list of books to read! looks awesome, thanks for the review! Julie, I've read In a Perfect World and you are spot-on about great book group discussion points! I do like dark books so it was an easy read for me. This sounds like a very timely read. Thanks for the review. Now that I've had a day to think about it, I think what I loved most about this book was the way that the characters grew and matured and the way that there was still love and hope in their lives even as the outside world was deteriorating. It was dark, but not depressing, for me because of that. I have to go to another harper perennial event tonight but I can't wait to listen to the show tomorrow morning! I passed on a bunch of my questions. I am very curious about this book now. I am going have to add this to my TBR list for a time that I am already sad. It sounds like it will bring the perfect amount of sadness but also hope? It will be like listening to country music in book form. Thanks for the interesting review. I was uncomfortable while reading it too but in the dark recesses of my mind I kept thinking that this could happen and it scared the heck out of me. There is something so fragile about children and the desire to protect them can be strong and that really came through. This is a great review. I like reading reviews that give honest feelings and you did that well. Thanks for the honest assessment. Sounds like an interesting book that I hope to check out at some point. You've really knocked out all your points quite well and the book still sounds like something I'd like to read. I like medical-related stories. Hmm, not sure whether this one is for me, but your review is great. Thanks for the review!